Could Auxmoney Fee Hike Damage Image of P2P Lending? Auxmoney.com is the second largest (by loan volume) p2p lending service in Germany. The new loan volume per month is about 700,000 Euro (approx 900,000 US$). A recent estimate puts the monthly revenue of Auxmoney at about 57,000 Euro (approx. 74,000 US$; based on August numbers). The majority of these revenues comes from the sale of so-called ‘certificates’, which the borrower can optionally buy. Examples for certificates are credit scores, income validations or car value assessments. The fees for the optional certificates as well as the listing fee are due in any case – regardless whether the borrower’s request for a loan is funded or not. A new rule in the terms and conditions states that the auction duration of a listing that has not completely funded after 14 days will automatically prolong as long as the listing is not funded or the maximum duration of 90 days is reached or the borrower objects to the prolongation. The borrower can object to the extension any day he wants by pressing a button in the online interface. If he does that the listing ends after 5 more days. Every additional day (!) of extension (beyond the original 14 days) the borrower is charged 1 Euro (approx. 1.28 US$). Therefore if the loan does not fund within 90 days and the borrower did not stop the listing, he is charged 76 Euro extension fee on top of the original 9.95 Euro listing fee. With the legal construct Auxmoney has selected, the listing fee, the fees for the certificates and the extensions need not be factored into the APR that Auxmoney calculates. Could these circumstances damage the image of p2p lending? P2P Lending worldwide has received positive press coverage and benefits from offering an alternative to the currently ill reputed banking sector. Only occasionally are single players causing bad publicity (e.g. the high default rates of Prosper or the Boober failure). Looking at the German market, press coverage for p2p lending was nearly all positive. One exception was the warning of a well-known consumer advocacy which accused Auxmoney of using false marketing claims on its website. Auxmoney sued the publisher – the case is still ongoing. The latest change in the fee policy of Auxmoney could lead to a negative change in the perception of p2p lending by consumers. Should internet users start to associate p2p lending with high fees that are charged even if no loan was obtained (currently on average 10-20% of all loan listing on Auxmoney are funded – see green line in this chart) then p2p lending would risk losing any competitive advantages over bank loans. Fees at other p2p lending services have risen several times in the past too in the struggle of these marketplaces to become profitable. While these fee increases do impact the attractiveness for the users the difference is that at least the fees in most cases only apply to loan transactions on funded loans. Auxmoney.com has added more loan term choices for it’s p2p lending borrowers to choose from on the weekend. Previously available loan terms at Auxmoney were 12, 24 and 36 months. Now any term between 12 and 60 months (in 6 month increments) can be selected. Auxmoney achieved substantial growth rates in the second half of 2009 (see Wiseclerk statistics tracking Auxmoney loan originations per month). And this is despite the fact that Auxmoney was criticized by a renowned consumer advocacy institution for misleading marketing and unfavourable fee structures. In international comparison of p2p lending fee structures, Auxmoney is a rare exception, as it charges many fees regardless of whether a loan request is successfully funded or not. With it’s listing fees Auxmoney generates revenues even from those customers with bad credit history that have little or no chance of getting funded by lenders. MYC4 will change its fee structure for borrowers for new loans starting in July. One main point of criticism had been that MYC4 by charging origination fees profited from any loan, regardless whether it was paid back or defaulted. MYC4 has reacted. In future there will be no origination fees and only fees on the interest of the repayments. This uis a step in the right direction as the interests of MYC4 are now more aligned with the interests of the lenders. To make or increase profit MYC4 has to avoid and decrease defaults. We have made a strategic decision with regards to the way MYC4 earns money by removing “closing fees” and only charging “interest fees” on the loans, when they are being repaid. That means that we put ourselves on the same side as the Investors on MYC4 only earning money when the Borrowers repay their loans. With this change we want to signal that we believe strongly in the viability of the Businesses, and to align MYC4 earning with the earning of the investors and similar to investors be affected by any defaults and currency fluctuation. Concretely, MYC4 will change the current income structure, where the Borrower is charged a flat fee of 2% of the loan amount, payable only when the loan is actually disbursed, and an additional fee of 2% (interest spread) when the loan is repaid on the basis of a declining balance. This corresponds to a total fee to MYC4 of approx. 3 percent of the total loan amount. Instead, we will charge 6% interest commission. Considering a 12-month loan time, this 6% charge matches the 2% on initial balance plus the 2% on outstanding balance fees. The change will in most cases be neutral for the borrower. In the same line, MYC4 encourages our Partners to shift their income from closing fees to repayment (interest) fees to show their belief in the quality of their portfolio towards investors. However, our Partners are not obligated to change their income structure, so it is up to each of them if and when they will change due to for instance their cash-flow situation. Today Lending Hub announced the launch of the p2p lending service aimed at loans between family and friends. Lending Hub is a private Australian company based in Sydney (Read earlier coverage by P2P-Banking.com on Lending Hub, including a guest article by Director Ivan Martelli). Lending Hub loans are 3 year unsecured loans. Currently most loans listed seem to be example loans. Lending Hub fees for borrowers are a listing fee of 30 AUS$ plus a settlement fee upon funding ranging from 1.25% to 4%, depending on credit grade. Lenders pay a fee between 1% and 3% of each repayment depending on credit grade. In Germany p2p lending service Smava.de will increase its fees in February. Smava management said the fee increase is necessary to build a sustainable business and points out that now 20 months after the launch the value proposition of Smava has been verified. Median ROI is given as 9.4% with 90 percent of lenders (best and worst 5% cut off) earning between 4.7% and 12.9% ROI per year. This increase will more than triple Smava’s revenues from 8,000 Euro per month to 27,700 Euro per month (estimate based on 800,000 Euro loan volume per month; 5,500 Euro average loan amount; average bid amount 330 Euro; 50% of loans for each loan duration). 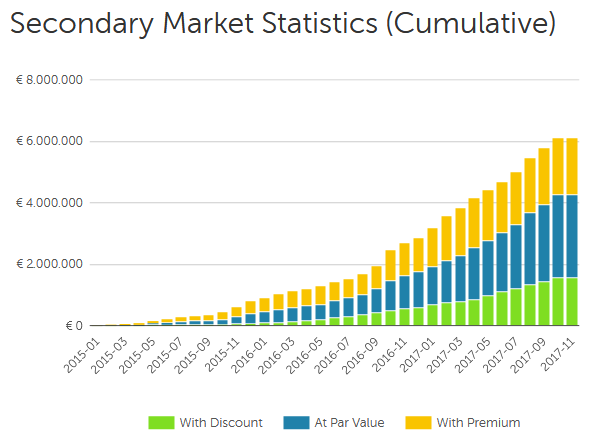 While the fee height is tolerable for most lenders, I am somewhat sceptical whether Smava is attractive enough for borrowers under the new fee schedule and will be able to continue its required growth.